RVers fall into several categories: there are those who simply like to relax at a campground and enjoy friends, food, and fires. There are others who use RVs as a way to get into the backcountry and ride ATVs, and still others who enjoy camping with amenities close to their favorite outdoor activities, like hiking and biking. One group of RVers we don’t often think of are golfers. Yes, Rving and golf! As a recent golf convert and mountain biking enthusiast, I can tell you that golfing and camping go hand in hand. There are golf courses in almost every decent sized town around and they’re always beautiful places. In towns where mountain biking is big? Golfing exists too and the scenery is stunning! As bikers, when we decided to start golfing again, we realized how much sense it made: Rving and golf? Yes! There are gorgeous courses to be found, public ones that aren’t high-priced. We often need a break from biking, so this seemed like a great way to explore new areas, camp, and still get in a great outdoor activity. One of the first places we explored was Ridgway, Colorado. We’ve always loved camping at Ridgway State Park, and for good reason. There are playgrounds and showers available, a laundry room, spectacular views, and fairly private sites at the Elk Ridge campground. Biking is nearby on County Road 10, and there are great restaurants in town. We knew there was a golf course, The Divide, high up on a bluff above town. Our most recent trip down there gave us the chance to check it out. Divide Ranch and Club is secluded and beautiful. If you play after 2:30 you can play 9 holes for $25 or 18 holes for $35 (not including a cart). The course is twisty and steep, with lots of doglegs and hills involved ( none of which are seen in the photo below). We had a great time here and enjoyed exploring and finding something new in one of our favorite towns. The views of the Sneffels range didn’t hurt either! From our usual camping area of Horsethief Campground, it took a good 20 – 30 minutes to get to the golf course, which is on the south side of town. Once there finding the driving range, #1 tee, etc was easy. The course was enjoyable, but beware: there are multiple lakes and other hazards for losing balls! If you’ve got a permanent bed in your RV, you can secure the clubs to the bed using bungee cords so they don’t roll around while traveling. This can also be done on the bunks of a bunkhouse RV. If you have storage under your bed, this is another great option; pass-through storage can also be used for storing golf clubs, though you’ll want to make sure they aren’t rolling around in there. Finally, if you’ve got a murphy bed, there may be enough storage under your couch for your clubs too. 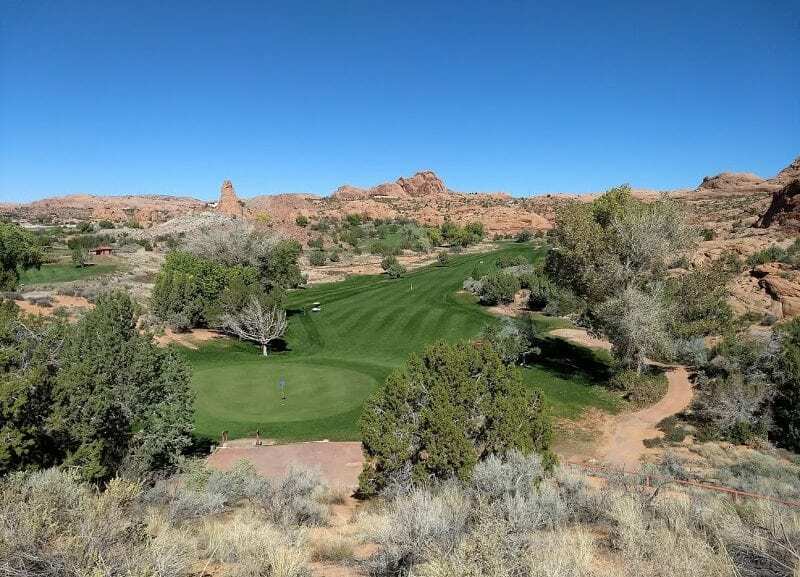 There are lots of great areas in the west in which to combine RVing and golf with biking: St. George, Utah, Park City, Utah and Grand Junction, Colorado all offer a variety of mountain bike trails and public golf courses. There’s no reason to think you have to sacrifice a hobby when you’re out camping – just find a way and a place to do it all!